People have always strived to embellish their environment as a way of transcending the reality. Be it architecture, furniture, or clothing, people bring forth intricate patterns into existence in order to make it more than it is by nature’s default. Hailing all the way from 3rd century BCE in China, embroidery is one of the oldest ways to make raw fabrics into a signaling of social standing and wealth. From family crests and heraldry, to unique monograms, embroidery served for thousands of years to make one stand out from the crowd. Of course, up until recently, before electricity and engines, only cultivated artisans from a long tradition of embroiders were able to engage in this craft, making it their bread and butter. Today, you can create intricate designs that would be the envy of even the most masterful embroiders of the past. And doing it in your free time, no less. Combining precise machinery with advanced digital technology, Brother PE770 is an embroidery specialist. Meaning that you can’t use it for regular sewing, but exclusively for monograming and embroidering. Let’s take an in-depth look to determine if such sewing machine specialization is worth the price. 136 built-in embroidery designs, of which you can cycle through 6 lettering fonts, 10 frame shapes, and 12 border styles. Combining them gets you thousands of unique combinations, and even more when you consider using differently colored threads for each embroidering element. Automatic thread cutter, a must-have feature for precise and often changing threading. Easy and precise threading mechanism. Embroidery stitching speed of 650 spm (stitches per minute). Bobbin system that can be easily and quickly set. Monochromatic LCD screen with backlighting. Advanced design editing in the form of rotating, previewing, size-adjusting, and mirror-imaging. Bright LED lighting that will make your eyes grateful. Compact and portable at only 8lbs weight. Thanks to the inclusion of the USB port, in which you can plug in a memory stick, the in-built 136 designs are just the beginning of your embroidery exploration. This modularity can vastly increase the selection of embroidery designs, theoretically increasing your combination potential to tens of thousands of unique designs. At that point, your imagination literally becomes your only limit in embroidering. If you are wondering from where to download the additional embroidery designs, Brother has you covered at www.iBroidery.com. This download center has a huge number of categories to explore, from legendary cartoon characters to abstract patterns and geometric shapes. This is one of the reasons PE700 made it to our hat sewing machines list. Unfortunately, you will have to pay for them due to licensing and the maintenance of the site, which continually adds new designs and patterns. We suspect that this extra income avenue also lowers the price of the sewing machine as well, similar to how manufacturers of printers take their income from inks, thus enabling them to offer super-cheap printers. Another method of adding additional designs is to look for compatible websites with designs free of charge. You should have no trouble as long as the files are in PES or DST format. Lastly, you can buy a Brother memory card, which can be slotted into the machine’s card slot. These memory cards are not included. Anyone who is already familiar with the Brother brand already knows that all of their machines follow the tradition of easy-to-use, no matter your skill level. The Brother PE770 embroidery specialist is no exception. The automatic thread cutter is important with your regular sewing machines, but even more so when it comes to embroidering due to a more intricate and shorter threading work flow. This feature alone facilitates its user-friendliness. Additionally, the automatic needle threading further alleviates you of the tediousness and frustration, leaving you to focus on the creative work on embroidering. But before you use the auto threading, take note of the numbered diagram for easy threading. It’s exactly what it says it is. To get you ready to transition from manual embroidering to computerized machine embroidering, a clearly illustrated step-by-step guide will be of great help, so you should definitely follow it to explore all the options and combinations available. Lastly, the above-average embroidery area of 5×7 inches is highly welcome in creating a comfortable embroidering work space. Most embroidery machines have smaller areas to work with, especially hybrid ones. However, given that Brother PE770 can only be used for monograming and embroidering, it would have been a serious omission to have anything less. You don’t have to worry so much about the type of fabrics, as you have to about using a stabilizer to facilitate the smoothness of embroidering. With a stabilizer you can run patterns through light to medium thick fabrics; from thin cotton, satin, fleece, to denim and leather (not too thick). If you want to embroider on uneven types of clothing, like hats and caps, you should definitely buy a hat hoop. As for which threads to use, avoid regular sewing threads. You will notice that embroidery threads are clearly labeled, of which polyester threads are the most common choice. The most easy to work threads are within 40 – 50 weight range. You can try to work outside that range but it will be more difficult, and lighter threads tend to break easily depending on the fabric they are applied to. At its default price, Brother PE770 is very costly, so you should look for an opportunity for heavy discounts on Black Fridays and Cyber Mondays. The LCD screen, although larger than standard, is monochromatic and basic, the one you can find on calculators. One would expect to have a properly backlit screen with much higher resolution, considering that you are dealing with intricate patterns and designs. You cannot add lettering fonts, only designs. The manual, although proficient in explaining everything else, lacks in describing the manner in which to hoop uneven fabrics. Look for Youtube tips for those case scenarios. When it comes to embroidery sewing machines, you will notice that you are entering a whole new price class, much greater than your regular sewing machines. This stems from the fact that embroidering work can be easily monetized; just take a look at the price of embroidering designs. If you are good enough and market yourself well, you can pay off the price of the machine within a couple of days! Notwithstanding how you intend to use it, Brother PE770 remains one of the best value embroidery machines. 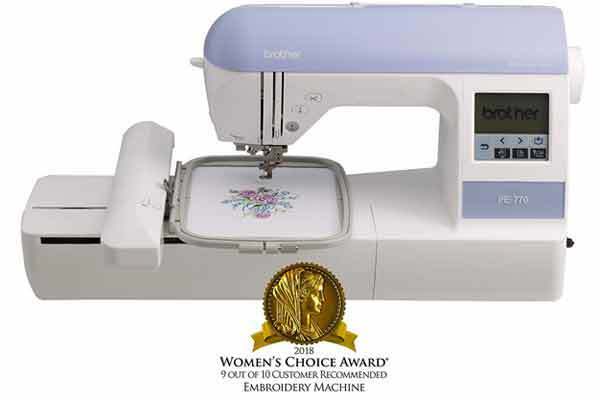 It is compact, the build quality is high, the embroidery design expansion is effectively limitless, and it has essential automatic features that makes it easy to use for many hours on a daily basis.